I love food: making it, eating it, and reviewing it. Ever since D and I moved to Montréal in 2004, we have kept a Montréal restaurant review guide with short reviews of everywhere that we've tried. When it comes to food, we are very picky. This food snobbery doesn't mean we're only interested in caviar and quail eggs, but we do expect food to be delicious and good value for the money. With writing reviews, we can hugely enjoy eating at a restaurant with terrible service, if only to note all their gaffes and report on them later. Equally, when a restaurant impresses at every level, we sing its praises to all and sundry. Last week, I received an email from Claire, one of the co-owners of Petits Gâteaux. She had read my (rather negative) review of Petits Gâteaux on my restaurant guide and invited me to come visit again since they had a new pastry chef. We came to an arrangement that she would provide some cupcakes for D and me to taste test in exchange for a review here and an updated entry in the guide. I fully disclose that the cupcakes shown above were provided to me free of charge. When tasting them, however, we kept in mind that the standard price is $2.85 for an individual cupcake or $15.00 for a box of six. The shop is very cute... cuter than the cupcakes, which were slightly sloppy in appearance and a bit dense and dry. The lemon icing was nice, but the pink stuff on the vanilla ones was over-sweet. Cocoa Locale is much better. Very cute shop, which matches the cupcakes. The raspberry-sour cream cupcake is stunning and the chocolat-poire and tarte citron cupcakes are delicious. There's an appealingly wide variety of flavours and styles. This place has vastly improved with the new pastry chef. My first impression was that I can understand why Claire was keen to have me visit again. As you can see from the picture, the cupcakes are certainly appealing looking. The shop was bustling with a long line-up when I entered. Despite everyone's natural indecision on which cupcakes to select, with 2 shop girls serving cupcakes, plus Claire, and another lady at the cash register, the line moved along speedily. I allowed Claire to choose a selection of the cupcakes and since I wasn't in a rush, I waited for one flavour that was still in the kitchen. This allowed me some time to take a few pictures of the shop and to see that there was very speedy turnover of cupcakes. Even late on a Saturday afternoon, fresh cupcakes were coming out regularly. After wishing me a good tasting and asking for feedback of anything that we did not like, Claire sent me on my way with a beautiful box of 6 flavours (tarte citron, raspberry sour cream, coffee, choco-poire, vanilla, and banana-fudge). Merci Claire! D and I cut each cupcake in half so that we both tasted each flavour. Overall, there was a nice variety of flavours and textures. Some were more like muffins, while others were definitely dessert confections. I particularly appreciated that there were some choices without icing, something that's often hard to find in a cupcake shop. Tarte Citron: A not-too-sweet lemon meringue pie inspired cupcake. It had a really yummy custardy lemon filling, though this filling did make parts of the crumb a bit gummy. Despite that, it was one of my favourites out of the six. Raspberry-Sour Cream: This was by far the most beautiful cupcake. All the raspberries were at the bottom of the cupcake, though. I'm not sure if this was intentional, or if they sank in the batter. I would have loved this cupcake if it had a bit more of the raspberry/sour cream tartness that I was hoping for. As it was, I just liked it a lot. Coffee: It had a nice coffee scent, but not overwhelming coffee flavour (though this might depend at what stage you eat the chocolate-covered coffee bean on top). It reminded D of coffee cake as in cake to eat with coffee. I think this was due to the slightly more muffin-y texture. After sharing three cupcakes, we needed a bit of break, so we put the rest in the fridge. The next day, I took them out for about an hour, before eating them. I figured that this was the sort of thing we'd do if we were purchasing cupcakes and likely, something other customers would do too. Vanilla: This was probably my least favourite and I'm not sure that I would buy it. For such a simple cake, it needs to be outstanding, and it was just OK.
Banana-fudge: This had a very good banana flavour with a delicious rich chocolate fudge on top. It was by far the most muffin-like in texture, which might or might not appeal to you. Choco-poire: A very rich chocolate cake with a juicy pear slice. I would highly recommend this one to anyone who doesn't like icing and it's certainly one I'd pick again (even though I do like icing). Rich and desserty, but not too sweet. Petits Gâteaux has definitely benefited from the change in pastry chef. I will certainly consider buying cupcakes from them again and in fact, I think it slightly dangerous how conveniently located they are. They have a wide variety of flavours, and also offer mini-cupcakes, not to mention a cupcake-and-beverage (milk, tea, or coffee) deal for $3.95. I think they offer something a little different from my other cupcake favourite, Cocoa Locale. If you visited before August 2007 and were disappointed, I'd say they were worth another go. 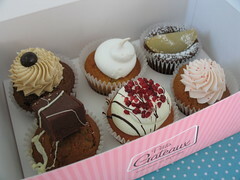 For more pictures of the shop and the cupcakes, see my Petits Gâteaux flickr set. Oh, huge yumminess. The raspberry one was *so* pretty. I hope they make it even better after seeing your review. What did the the cakes look like inside? Was the raspberry one pink? Odd that the vanilla cake didn't turn out. That's such an easy cake. Maybe they need the famous "whole egg cake" recipe published originally by Crisco. So the *real* question is, do they make a "low-fat" cupcake that's any good?? When do you send cards? Which 6 orchids do you prefer?